I love child themes. They are so much fun to work with, especially for people who have only enough PHP knowledge to be able to create some sort of nasty Fatal Error. With a child theme you are able to go crazy with your design, knowing that you have the solid functionality that comes with one of the theme frameworks/parent themes. I totally agree with Lisa on this – as a WordPress user it means I have much more flexibility to make a theme exactly how I want it to be, without my customizations being disappeared whenever an update comes along. 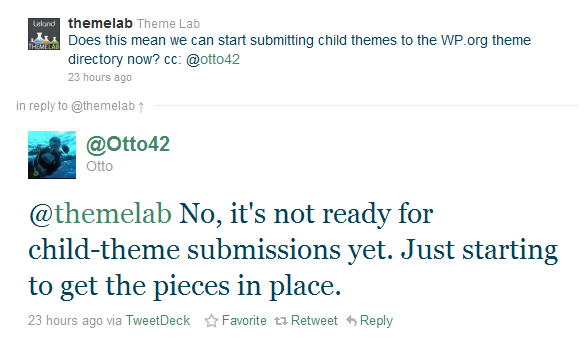 I can’t wait to see Child Theme support in WordPress.org. Hopefully this will mean that we see loads of new themes appearing, giving the WordPress.org directory a new lease on life. You can check out the thread on the WordPress Development Update Blog.